Today I found out about the amazing acoustics of the ancient Epidaurus Theatre. Epidaurus, Greece was a small, unassuming city in ancient times, best known for being the supposed birth place of Apollo’s son, Asklepios the healer. As Asklepios’ following grew, so too did the town. Their medical centre became one of the most well-known in the classical world, attracting sick people from all over the known world who hoped to be cured by the healer god. An area known as a Sanctuary developed in an elevated mountain valley, connected to Epidaurus by an ancient road. There, temples, baths, and athletic facilities were constructed as a means of worshiping Asklepios. But perhaps the best-known method of worshiping the healer god was at the theatre. The theatre was designed by Polykleitos the Younger in the 4th century B.C., a period that saw construction of many of the Sanctuary’s buildings. Typical of theatres built in the Hellenistic period, the Epidaurus Theatre has a tripartite structure, meaning it has an orchestra, auditorium, and stage building. The auditorium was carved into the side of Mount Kynortio at an incline of 26 degrees. Originally, the theatre had 34 rows. However, another 21 rows were added at the top, probably during Roman times. With the additional rows, it can seat around 14,000 people. But the cool thing about the theatre is its acoustics. Even individuals sitting farthest from the stage—about 60 meters—are able to hear actors without any amplification. By the rules of mathematics and the method of music, they sought to make the voices from the stage rise more clearly and sweetly to the spectators’ ears… by the arrangement of theatres in accordance with the science of harmony, the ancients increased the power of the voice. Early theories concluded that the wind carried sound to the viewers, or that masks worn by the actors amplified the sound. But researchers today have now solved the mystery in a more concrete and scientific fashion. As suspected, the architecture of the auditorium allows the sound to be carried from the stage to viewers sitting in the very back row. Sound is carried easily due to the specific slope of the rows. There is another significant factor, however: the seats themselves. Researcher Nico Declercq and others from the Georgia Institute of Technology conducted a series of experiments with ultrasonic waves in the theatre. They found that frequencies up to 500 hertz were lowered, while frequencies that were higher remained the same. Basically, the steps acted as “acoustic traps,” filtering out background noise like wind and the movement of people, which is typically under 500 hertz. Not only that, but it would also filter the lower frequencies of actors’ voices. Because of this, the listeners experienced a phenomenon called “virtual pitch” in which they filled in the missing tone themselves. The result is a higher clarity of sound, which makes it easier for the people in the back row to hear what’s happening up front. There have been several attempts to recreate the acoustics of the Epidaurus Theatre throughout history, and none have been quite up to par. Though the design has been mimicked, the seats were usually made out of wood in the copycats, which is probably why the acoustics weren’t as great. Further, it’s thought now that the corrugation in the stone seats of Epidaurus is the reason for the acoustic trapping, which means it would be difficult to replicate. The theatre remained in use for nearly 1000 years. It wasn’t until 426 A.D. that Theodosius the Great banned all activities at the Sanctuary, which saw the theatre fall into disrepair. The auditorium, however, was preserved under a layer of earth. In 1881, the Archaeological Society started to excavate the area and found the theatre relatively well-preserved. It soon attracted attention from across the globe, and there was a call to repair any damages and put the theatre to use. The final wave of restoration wasn’t completed until 1988, involving roping off some of the more fragile sections of the theatre and refurbishing some of the seats. That same year, it was made a UNESCO World Heritage Site. However, the theatre was in use long before that. The discovery of the theatre coincided with—or perhaps caused—a resurgence of ancient drama. As early as 1936, plays were being performed at the Epidaurus Theatre, including those by Sophocles and Euripides. 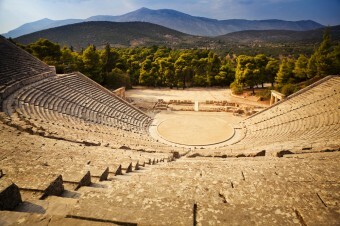 In 1955, the Greek government founded the Athens and Epidaurus Festival, which takes place every summer. The festival celebrates Greek history and plays that are over 2,500 years old. And yes, the acoustics of the theatre seem to work just as well as they did when it was first built. Declercq’s study also looked at the acoustics in the summer and the winter to see if there was a difference due to variations in air density and other factors during different seasons. They found that the acoustics are more or less the same in both seasons. The way the medical centre at the Sanctuary worked was ailing patients would spend a night in a big sleeping hall called enkoimeteria. There, Asklepios would visit them in their dreams and tell them what they needed to do in order to get healthy again. How far modern medicine has come—but it seemed to work for them, at least they thought it did. In fact, the centre was so famous that it was used for many years after Christianity was introduced, though it was then turned into a Christian facility. Despite seeing so much prosperity in the 4th and 5th centuries B.C., or perhaps because of their prosperity, the Sanctuary fell on hard times down the track. In 87 B.C., it was plundered by Sulla, the Roman general; in 67 B.C., pirates decided to take advantage of whatever Sulla had left; and in 395 A.D. it was invaded by Goths. Shortly thereafter it was shut down.